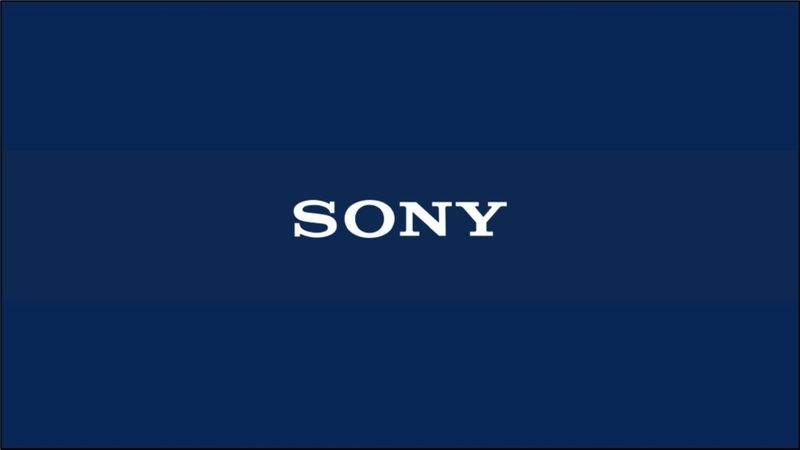 In a year of falling profits, 50% lower than the previous year, Sony (TYO:6758) are extremely bullish for the future. The fall in profits this year were caused by a number of factors. One large impact was the 2016 earthquake that forced the closure of their semiconductor manufacturing facility. In addition is falling sales across multiple divisions and a large write-down for Sony Pictures. Of course in addition to this there have been large fluctuations in currency exchange rates. These have been highlighted as a warning factor. Despite this, net income for the company is expected to grow 250% year on year. One of Sony’s larger issues is the difference between its divisions. For the most part the company has seen decreased income across multiple areas. Great advancements have been made in Mobile and games divisions but there has been significant drag in other areas. One of the company’s largest losing areas came from the film division. This segment saw a loss of JPY 80.5 billion, JPY 119bn lower than the previous year’s profits. This did, however, include a write-down of JPY 112bn. The damage from this, as well as the damage caused by the earthquake to the Imaging Products & Solutions, Semiconductors and the corporate divisions is one of the larger causes in profit reduction for the company. 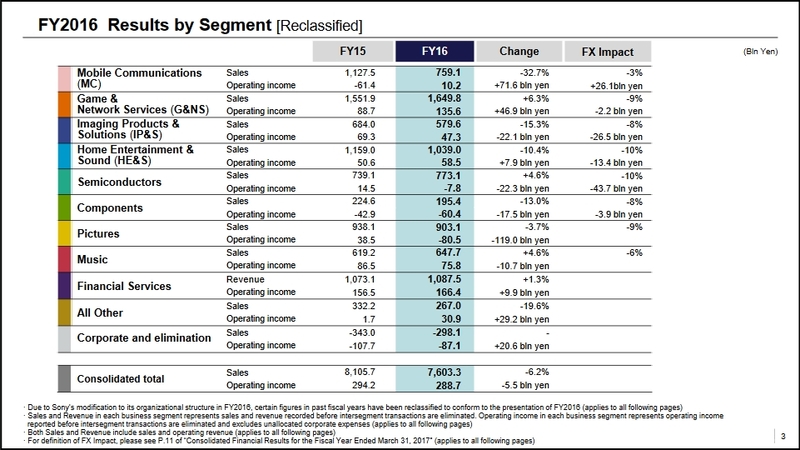 Some large turnarounds have been found in the mobile sector, which has swung from a JPY 61.4bn loss to a JPY 10.2bn income. This has been attributed to restructuring, which reduced operating costs significantly. Focusing on a smaller range of models and limiting areas geographically, has also increased the value of the mobile division. Of course one of the mainstays of Sony now comes from its forays into the games industry. The PlayStation 4 has been a big success for the company. Three and a half years ago saw the launch of the PlayStation 4 and over time benefits have come from cost reductions in the hardware, but also the large increase of sales of software. The launches of PSVR and PS4 Pro also helped with the increase of sales. 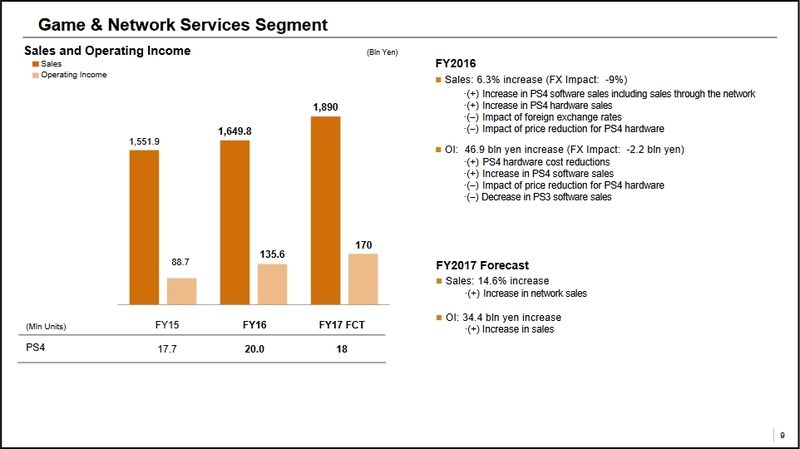 Sony Chief Financial Officer Kenichiro Yoshida stated “In FY17, we expect to increase both sales and operating income of the segment” and that this is “primarily due to an increase in network sales”. Yoshida also went on to state “we expect annual unit sales in FY17 to decrease year-on-year to 18 million units, but some major software titles are scheduled to be launched and we believe we are in the harvest phase of the platform”, which indicates belief that this is the period where major software sales should hit peak revenue. Although there are warnings on currency fluctuations, large factors to negate this year’s figures have been removed. The large predicted boosts in Games & Network, Semiconductors and Pictures are expected to drive profits over the coming year. 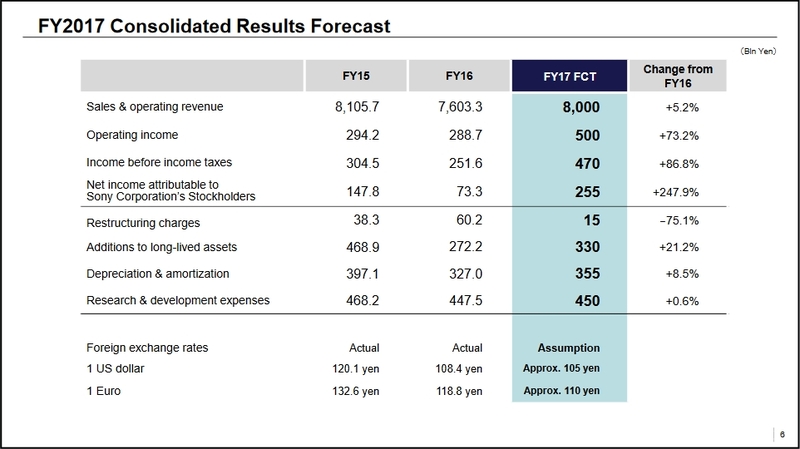 Expectations are for income to hit a high of JPY 500bn with profits of JPY 255bn. The coming year could be a bumper year for the company and certainly one to follow.